Peter Davison enjoyed stepping into the shoes of 'loser' Nicky Frazer in 'Secrets & Spies'. "At my wedding, a dear friend of mine who is a director said that the irony of my career was that I'd made a huge success of playing complete losers. Well, Nicky Fraser is another one. "He's an alcoholic, ex-Colonial type who lives in the shadow of his father and his wife doesn't love him. But he clings on fairly arrogantly and just ploughs ahead in life in an alcoholic daze. He's a complete loser. His crisis is that he desperately wants his wife to love him but he's not man enough for her." Frazer is a former spy and keen cricketer, despite his lack of sporting prowess. Says Peter: "I do play cricket for the Taverners and I've also played for some showbiz teams. We played at the Getty home and we had a window of good weather, so it was a great experience for me. "However it goes right against the grain for me to have to play cricket badly. As actors, we like the idea of being quite sporty. I am actually quite good at cricket so having to play a miserable cricketer was quite frustrating. I keep getting bowled out and it takes some skill to keep missing the ball like I did!" Peter joined the cast at the same time as filming ITV drama Unforgiven with Suranne Jones. "I was asked to step in and play Nicky Frazer at the last minute and I was happy to do it because Brian True-May, the producer, is a friend of mine - we worked on Harnessing Peacocks together. It was quite refreshing not to take the lead role and I enjoyed the whole experience. The more you get into Midsomer, the less absurd it seems. "John Nettles was so welcoming and I loved working with Benjamin Whitrow as my dad. He is such a funny man and I'm glad that there are still people around to play my dad and I can still be a son occasionally." John Bowe had no doubts about taking the role of Jimmy Wells - even though he'd never seen an episode of the popular drama. "I was aware of Midsomer Murders, of course, but I have five kids in the house so I never get hold of the remote control. When I read the script I thought it had a good comic element. Michael Aitkens, the writer, also wrote Class Act which I was in, so I identified with the humour straight away. "I was Gratiano to John Nettles' Bassanio in The Merchant of Venice in the late 70s and John had asked me on two previous occasions to come to the series. When this role came up, showing me larking about playing cricket and with Alice Krige as my love interest, that did the trick. "Alice and I were at the RSC together and we played husband and wife a couple of times. Blitzkrieg is my nickname for her - it was great to work with her again." 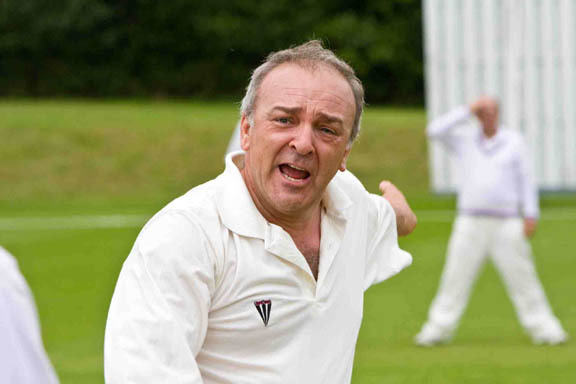 John's character Jimmy Wells is a keen cricketer who organises the village team against the so-called 'Toffs' of Midsomer Parva. "He's a complete wide boy and Michael Aitkens told me he'd based him on an old friend who was a bit of a hero. Jimmy has a past, he's served his country and he's been put out to seed in the countryside as long as he keeps his mouth shut. "It's always fun to find the wicked nuances in a bad person and it's easier to play the villain than trying to find the interesting aspects in a good person." John also enjoyed the cricketing side of the role. "I played cricket for my school so I told the producer I was bloody good. But I was an opening bat at school and for the script I needed to be a fast bowler. So I had to fake it, which I think I did to a reasonable level. It was quite punishing but I am happy to say that some of the younger members of the company were suffering more than me after the third day. I think I did 50-year-olds proud!" Adds John: "I wore a blazer and slacks together with my own whites. I have them because I played a lot of celebrity cricket when I was working on Coronation Street. It was a great inducement to the job to hurl bouncers at Peter Davison and Clive Wood. That gave me great delight."